Fonded in 1667 as a place where the Sun King's astronomers, members of the Academy, could work, it is still at the heart of French astronomy and a major institution in the world of science. Observations were made there up to the end of the XXth century, instruments are designed there, and theoretical work covering the whole of astronomy is done there. With its uninterrupted scientific activity, combined with a desire to conserve and archive, it has an extremely rich scientific and technical heritage. In Europe, the first meridian telescope was made by the Danish astronomer Roemer; it was the first of its kind, which Roemer called the Rota Meridiana. The observation of a celestial body above the horizon gives its altitude; this is the complement of its zenith distance (the angle it makes with the local vertical). The value of this altitude is largest when the celestial body crosses the meridian. 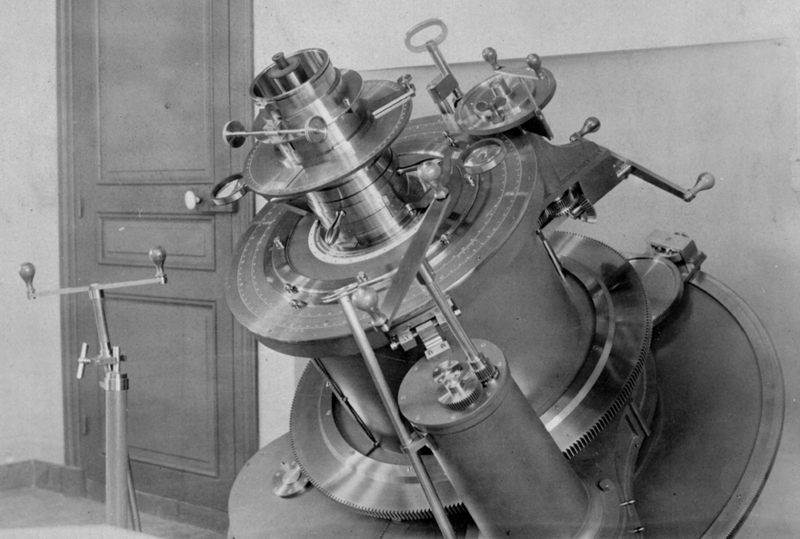 Roemer’s « Machina domestica » or meridian telescope. Image taken from Peder Horrebow, Basis astronomiae sive astronomiae pars mechanica […]. - Havniae : apud D viduam beati Hieron. Christiani Paulli, 1735. Even as the sectors equipped with a telescope increased in size through the XVIIIth century thanks to progress in metallurgy, up to the large mural quadrants made by the English instrument maker John Bird and of which the Paris Observatory has two examples, the instruments descended from the Rota Meridiana started to see the light of day. On the one hand, instruments of the transit telescope type, for the determination of the meridian transit time of a celestial body, began to appear; they were generally small and thus accurate. On the other hand, the sectors transformed into meridian circles; a complete circle with peripheral graduations and equipped with a telescope which could pivot around its center, furnished the zenith distance of the celestial body, and thus its altitude. The combination of the circle with a transit instrument gives what is generally referred to today as the meridian instrument. The original sectors were equiped with cross-hairs which enabled one to note the time of transit thanks to a clock. With the advent of electricity, the instrument makers were able to equip the eyepiece grid with mobile vertical wires, such that electrical contact was made when a vertical wire crossed one of the wires of the grid. The electrical contact was registered on a roll of paper running through a chronographic pen recorder. 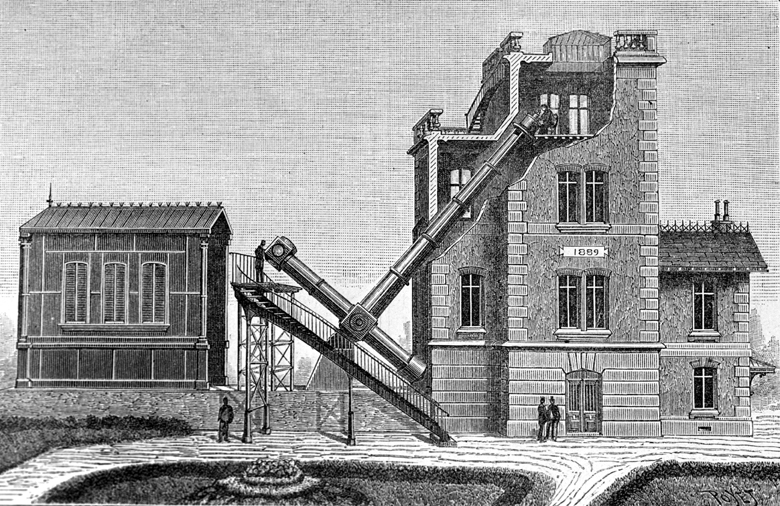 The texts describing the transit instrument, the so-called garden instrument, indicate that it was built thanks to the generosity of the banker Raphaël Bischofscheim who offered it to the Paris Observatory during Le Verrier’s lifetime. It was used to observe again the stars in Lalande’s catalogue of 5000 stars, then for various international programs. The last time it was used was for the establishment of the AGK3 catalogue: in fact, the Observatory was the first to finish the work for the part of the sky which had been attributed to it. It was replaced by the automatic transit instrument of the Bordeaux Observatory, than by the astrometric satellite Hipparcos. During its construction, the plans for the large room on the second floor of the Paris Observatory were modified by Jean-Dominique Cassini in order that a large meridian line could be established. However, it was his son who finished the construction during the period 1729-1732. 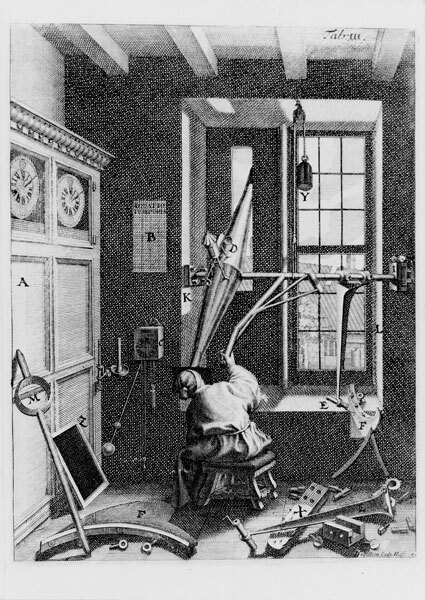 It was designed to be an extremely accurate astronomical instrument, whose function was to measure the meridian altitude of the Sun – to an accuracy of 10 arc seconds – in order to detect a possible change in the obliquity of the ecliptic (a slow change in the direction of the terrestrial rotation axis). 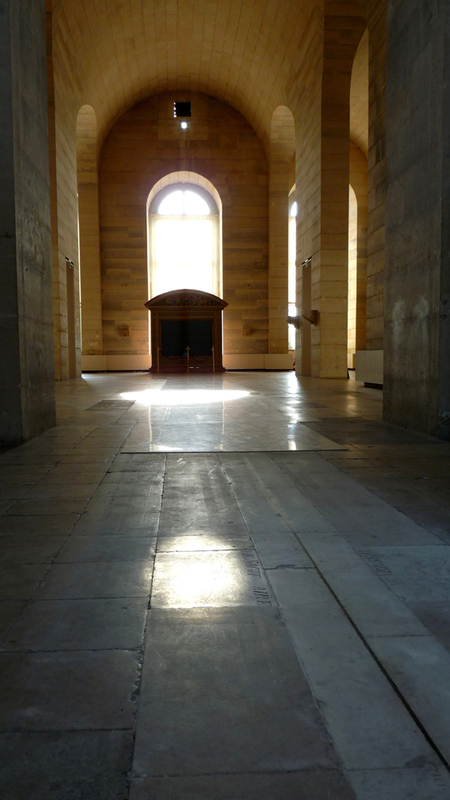 It is made of 32 brass strips, each almost 1 m long, embedded in white marble slabs; on this line is projected the elliptical image of the Sun from a gnomon consisting of a hole drilled at a height of 9,9377 m in a copper plate; the principle is that of the pinhole camera (the "camera obscura" in the language of the time). The marble path has a total width of one royal foot (32,48 cm), which ensures that the image will remain within its limits from one solstice to the other. Twelve additional marble slabs, engraved with zodiacal signs, complete the paving. The brass strip is graduated along its western and eastern edges, to give, respectively, the apparent altitude of the solar centre and the tangent of its zenith distance. This was the first of a series of very large meridian instruments which flourished up to the end of the XVIIIth century (notably at Saint-Sulpice, 1743; Santa-Maria del Fiore in Florence, 1756). It is the only instrument of its type built within a non-religious establishment. 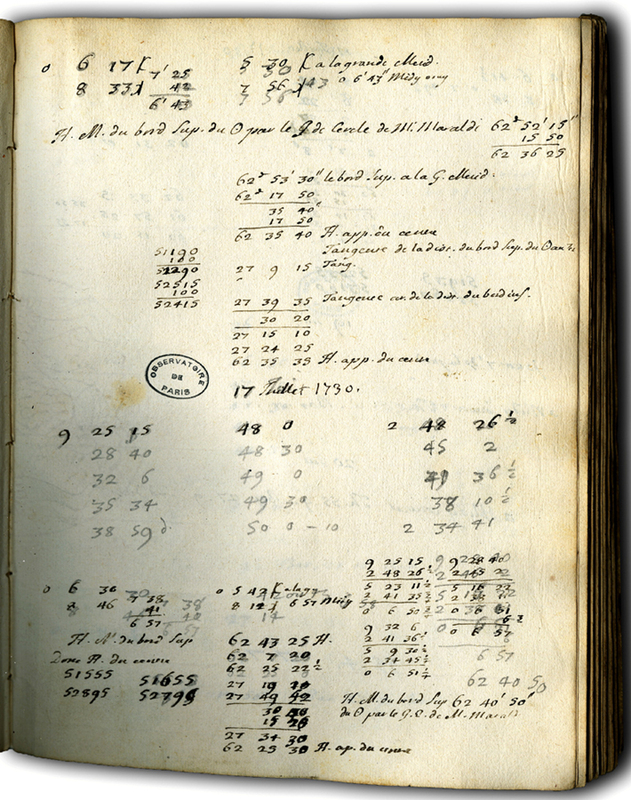 For 25 years - up to 1755 - Jacques Cassini used it regularly, and obtained thereby almost 450 observations. Today, a simple lens has replaced the gnomon. 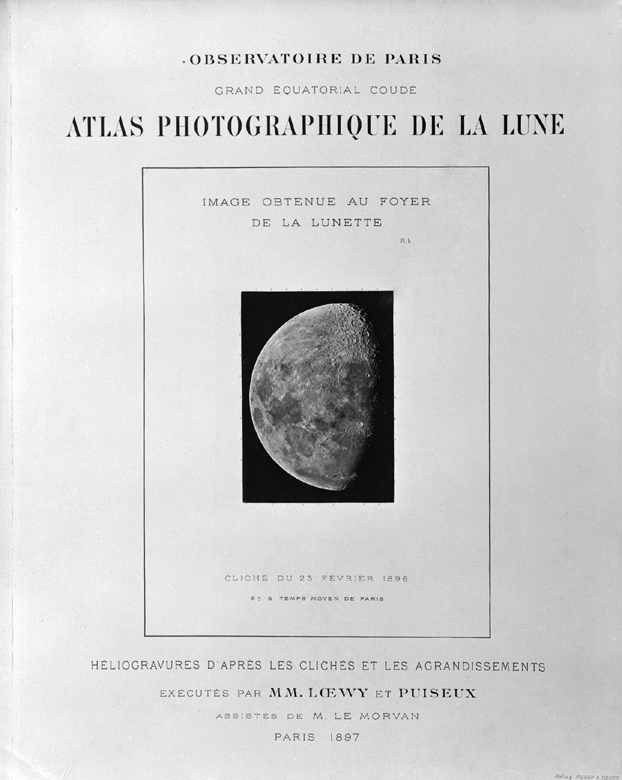 At the beginning of the 19e century, an astronomer at the Paris Observatory, Alexis Bouvard, employed to calculate the ephemeris of Uranus, realized that it was impossible to compute correctly the motion of this planet. He suggested that its motion could be influenced by the attraction of another as yet unknown planet. Many astronomers took on the task of proving this hypothesis and tried to find the new planet. 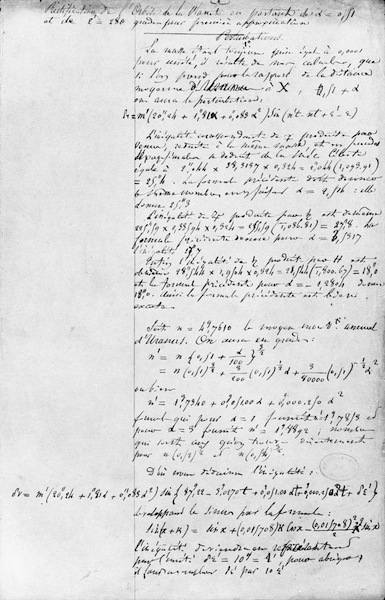 François Arago, director of the Observatory, asked a young astronomer who was at that time an assistant at the École polytechnique, Urbain Le Verrier (1811-1877), to take on the problem. 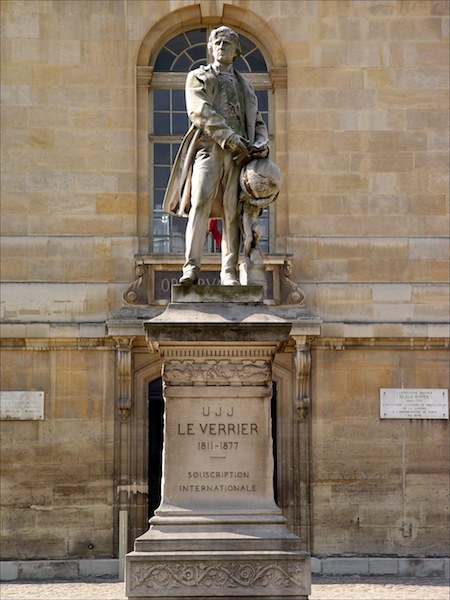 Le Verrier solved the problem in 1846 through some intensive computation, and predicted the position of the new planet, which was almost immediately found at the Berlin Observatory. This was Neptune, the most distant of the 8 planets of the solar system. Le Verrier thus became world-famous. 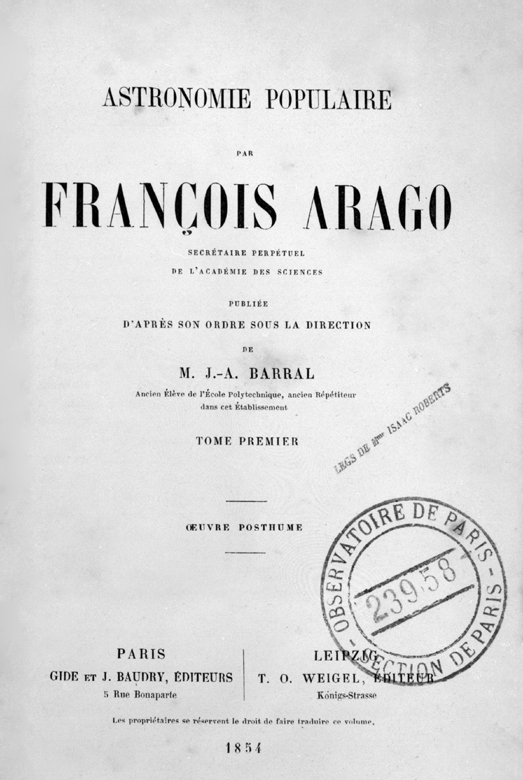 In 1854, he followed Arago as director of the Paris Observatory. In the gardens of the Observatory can be seen a millstone faced building in rather poor condition. It carries the date; behind it is a sort of large, rusty, metallic hangar. What is it? The first instrument designed according to this principle was built in 1882: this was the small equatorial coudé telescope. It has since disappeared; however, six other instruments of this type were built during the period 1884 to 1892. Two are still in their original state in the Lyon and Algiers observatories; there is another one in the Nice observatory, but it has been modified. The largest one was inaugurated in Paris in 1891 in the building which was finished in 1889. It cost 400 000 francs, including the building, which is equivalent to 1,2 million euros: this was the large equatorial coudé telescope. It was used to take magnificent photographs of the moon and stellar spectra; it was abandoned in 1939. Most of its parts still exist, but its restoration would require a very significant budget. François Arago (1786-1853) was hired at the Paris Observatory in 1807; he would be its director from 1834 to his death. 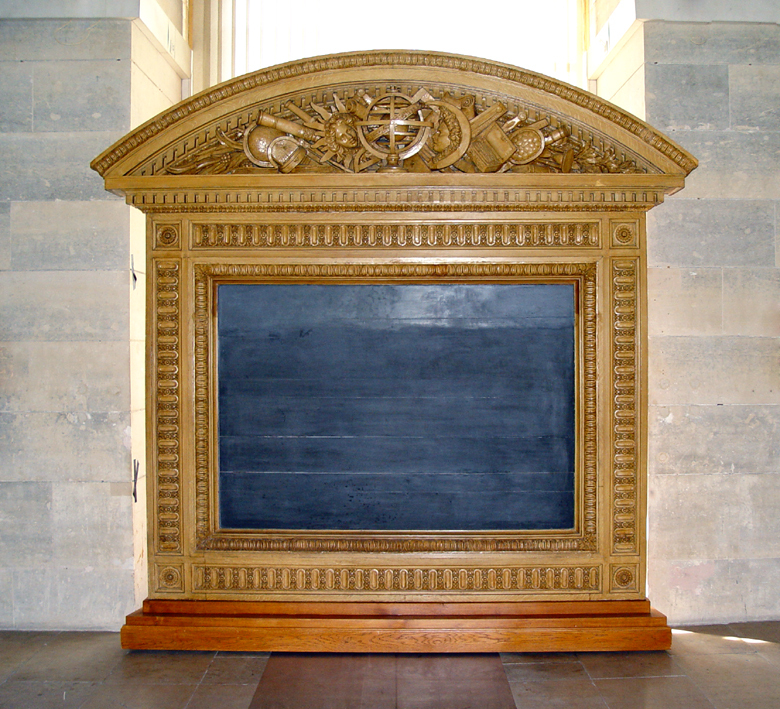 A first-class popularizer, his first lectures on « Astronomie populaire » ("Astronomy for all") were given in 1813. They attracted the celebrities of the time as well as a considerable audience, so much so, in fact, that their success went from strength to strength. 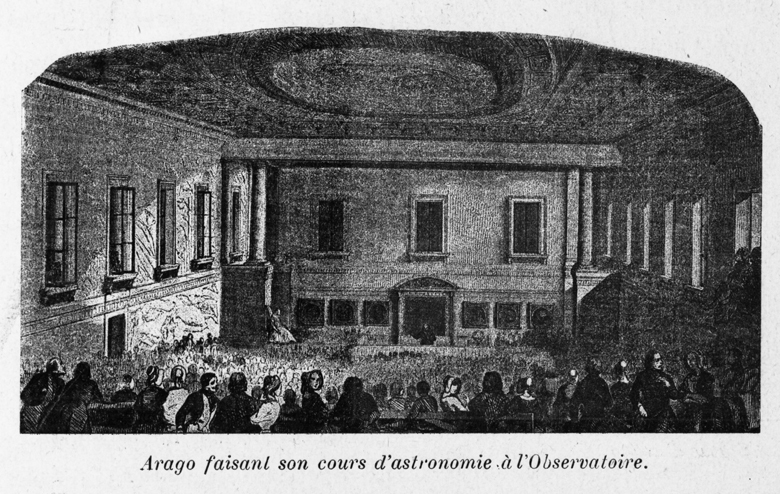 After having given his talks in more or less convenient places, Arago managed to obtain funding to build an amphitheatre at the Observatory. It was finished in 1841 by the architect Alphonse de Gisors; with 800 seats, it formed the west wing of the Observatory building, and was lavishly decorated. It was only used for five years, since severe diabetes forced Arago to stop his lectures in 1846. He died from his illness seven years later, after becoming blind. Astronomie populaire / François Arago. - Paris : Gide et J. 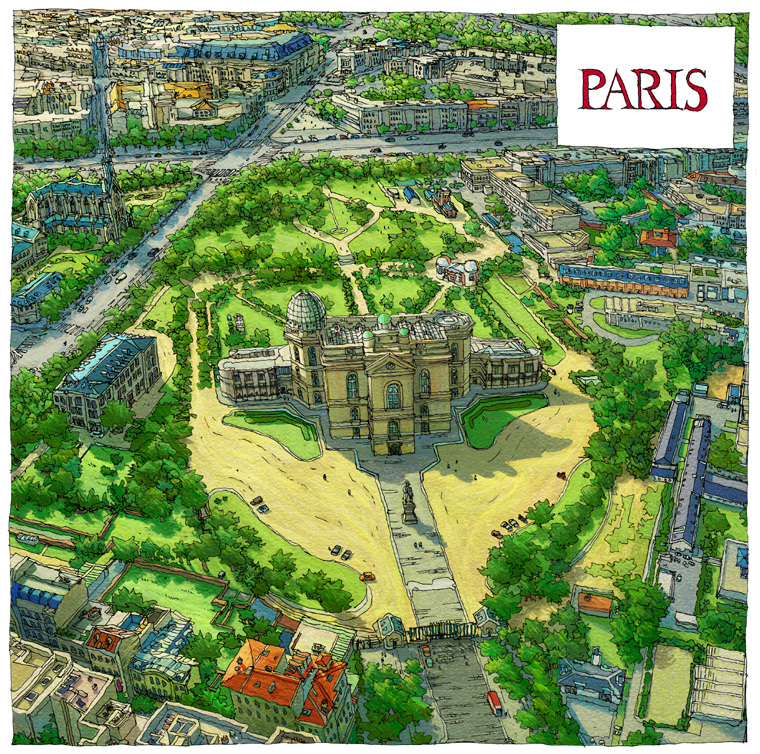 Soon after his arrival at the Observatory in 1854, his successor, Urbain Le Verrier, who was not at all interested in the popularization of science, demolished the amphitheatre and replaced it by his own apartment (covering 400 m2 !). Only a few decorative items, which were restored recently, have survived. We badly need this amphitheatre today. Click on the points of interest and the text will appear below the map. Astronomie Populaire on Gallica website.